"A corpse wakes up in Hell and finds out he cannot rest and must return to the land of the living to find his soul that still lives on inside the body of a priest and drag it back to Hell. When the moon turns red, you must walk with The Walking Dead." Oakland, California - FROM HELL is a new horror concept heavy metal band. 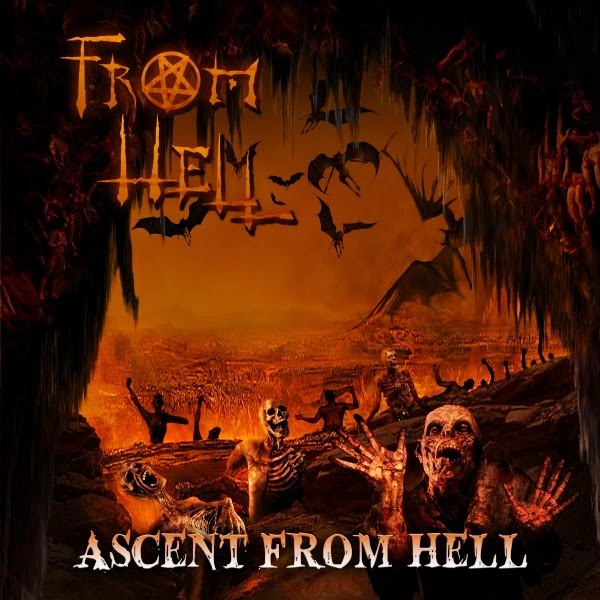 Their debut release on Scourge Records on April 8th, 2014 is called Ascent From Hell and it is as heavy as it is epic! FROM HELL is the brainchild of George Anderson aka Aleister Sinn, the live narrator of this horror story. This project began in 2007 after his previous band Down Factor with then drummer Ramon Ochoa, Brooks Rocco on guitar and Waylon Ford on bass broke-up. Interested in putting a different type of band together that was not involved in politics, George formed FROM HELL to tell horror stories in the vein of King Diamond. Every song is in some way linked to all of the other songs and when each album starts, they don't stop until the very end. After several line-up changes, during the recording of the first album, George enlisted some amazing players to record with him in FROM HELL. For this debut recording, metal icons Paul Bostaph from Slayer on drums, Steve Smyth from Nevermore on lead guitar and Damien Sisson from Death Angel on bass were recruited to make this record happen. This recording is diabolically epic, and heavy as Hell! Every song is different from the next covering many genres of metal from thrash metal and black metal to death metal and doom metal. This album is as dynamic as metal can be! Also participating in this recording is Phil Bennett of the iconic rock band Starship, playing piano on the track Dead Reckoning and a 22-piece choir, The Pacific Mozart Ensemble on four other tracks. Establishing new ground, this record has the first recorded blast beat by Paul Bostaph, orchestrated with shredding guitar solos from Steve Smyth and heavy melodic & syncopated bass by Damien Sisson. Produced by George Anderson and Steve “Snake” Green, guitar player from Skinlab, a Century Media recording artist, this recording is a theatrical 70 minutes long with segues in between each song to give additional detail to this horror story. With songs like The Walking Dead, Soul Crusher, Nun With A Gun and Ascent From Hell, this record will take you on a heavy metal horror ride to Hell! As one can imagine, with so many legendary players in its ranks, it is hard to schedule live performances. There is a CD Release/Listening Party and signing event scheduled for early April 2014 in Oakland, California. FROM HELL will tour the West Coast and select East Coast markets to support the release of Ascent From Hell in the summer and fall of 2014. FROM HELL’s show will include a few different guest performers and members of the band who play in other bands will perform as their touring and recording schedules allow. Visit the band’s website www.fromhell.net or www.scourgerecords.com for more information and future tour dates.